While not a conventional security topic, governance is a central feature in the often internal or societally based threats Nigeria faces. From ethno-religious faultlines to rising extremism among marginalized communities to weak military professionalism, a common theme for virtually all of Nigeria’s security challenges is poor governance. In many instances these security concerns are, in fact, symptoms of weak, exclusionary, or exploitative government processes. These security issues, therefore, will persist until the underlying problems of governance are addressed. Without good governance, a country makes itself vulnerable to drivers of insecurity. Take the rise of Boko Haram. On its own the organization has never been militarily powerful. However, it has been able to tap into grievances and mobilize marginalized Muslim communities in parts of northeastern Nigeria to propagate its extremist ideology and violence. Populations in northern Nigeria, for example, frequently exhibit quality of life indicators that are half that of other parts of the country. Similarly, income and economic opportunities remain relatively underdeveloped in the North. This sense of socioeconomic marginalization combined with the perception of collusion between northern politicians and the federal government have provided Boko Haram the levers it needs to recruit and wage its insurgency. The widely fluctuating tactics used by the government in handling the Boko Haram challenge also illustrate the importance of political will for effecting security. The government has alternated between heavy-handedness (including actions that have generated allegations of human rights violations) and passive responses (such as when the Chibok school girls were kidnapped). Once the government (in conjunction with neighboring armies) resolved to tackle it, Boko Haram was easily routed from the territories it held at the beginning of 2015. Boko Haram can and likely will be defeated. However, until the government earns the confidence and trust of its citizens, any security gains realized will not be sustained. The lure of insurgency against the status quo, often infused with a religious cause, will continue to draw disaffected youth. There were radicalizing elements in northern Nigeria before Boko Haram, and the same insurrectionist messages will be present after Boko Haram is dismantled. The government’s goal, therefore, should be to establish enough credibility and legitimacy with local populations so that such messages will fall on deaf ears. Research shows there is a “tipping point” whereby once a threshold of institutional corruption is reached, for every slight increase in perceived corruption, a large decrease in domestic security follows. Nigeria ranks among the 38 most corrupt countries in the world (it scores 27 on a scale of 0 [very corrupt] to 100 [very clean] for perceived level of public sector corruption). Nigeria’s political patronage system and high-level corruption are well documented. More than half of the Nigerians surveyed by Transparency International have paid a bribe. Peace and prosperity are most susceptible to the corruption of security institutions, especially the police and justice sectors. In Nigeria, crowd-sourced websites track in real time where police are attempting to collect bribes from motorists. 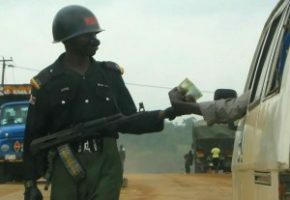 The level of perceived corruption of Nigerian police is problematic (92 percent of those surveyed by Transparency International). According to the Institute for Economics and Peace, as perceptions of police and judicial corruption increase, trust in these institutions declines. As this sentiment takes hold, norms shift, and citizens begin acting in a more lawless manner themselves. A country is then more likely to experience violent crime, conflict, and eventually political terror. When the judiciary fails to bring perpetrators to justice, citizens no longer feel safe and change their behavior accordingly. This, in turn, negatively affects socioeconomic activity. In contrast, as corruption decreases, prospects for stability improve. As countries become more open and peaceful, there is a marked decline in the perceptions of police and judicial corruption. Countries with stronger democratic institutions tend to show the lowest levels of perceived corruption. Controlling corruption is closely linked to building trust. Communities in marginalized areas are looking for tangible demonstrations of government commitment to improving the lives of the poor—especially in the area of public goods such as roads, educational opportunities, health services, and communications infrastructure. This requires more than allocating funds for these development initiatives. It also requires establishing the oversight mechanisms to ensure these resources have their intended impact. Building trust in government depends not just on the physical outputs but also on the “process” by which the government engages communities. This will entail acting with transparency and accountability in the selection and implementation of development projects. This engagement, in turn, can diminish perceptions of inequality and partisanship. In other words, mobilizing catalysts for organized violence are often based on a sense of relative deprivation. If, instead, the government is seen as inclusive and even-handed in its engagements, this lever of mobilization will diminish. Trust can also be strengthened by engaging a wide range of individuals from marginalized communities in a dialogue so they can assert their preferences and gain some ownership of public initiatives in their localities. Building trust will also require active communication so that citizens in marginalized areas understand what the government is doing on citizens’ behalf. In so doing, the government is also better able to counter the negative messaging of insurgent groups. The creation of a transparent and participatory political system will require more direct input from civil society reflecting diverse local actors, particularly women and young people. This will also at the outset require more time for citizens to articulate the injustices they have endured so that tensions do not fester. Citizens must see that they have opportunities to be heard and to succeed working within the system rather than outside or against it. As Nigeria’s leaders engage these diverse voices, they will earn trust and be better able to articulate visions transcending sectarian interests. Peace and Corruption 2015: Lowering Corruption – A Transformative Factor for Peace, Institute for Economics & Peace, 2015. Laura Davis, Supporting peaceful social, political, cultural and economic change in Mali, International Alert, April 2014 (French version). 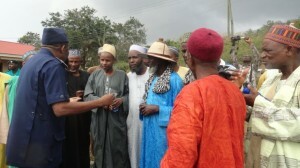 Chris Kwaja, Nigeria’s Pernicious Drivers of Ethno-Religious Conflict, Africa Security Brief No. 14, July 2011. Ehimika A. Ifidon, “The Appropriated State: Political Structure and Cycles of Conflict in Nigeria, 1900-1993,” African Journal of Political Science 3, no. 2 (1998), 1-14. Hussein Solomon, “Governance Reforms May Be More Effective than Military in Countering Boko Haram,” presentation at the Africa Center for Strategic Studies, National Defense University, Washington, DC, March 28, 2013.